Shirley Purdie has been painting for more than twenty years and is an artist of increasing significance and seniority. Her cultural knowledge and artistic skill complement each other to produce a practice that holds great strength. Shirley is also a prominent leader in Warmun community and an incisive cross-cultural communicator. 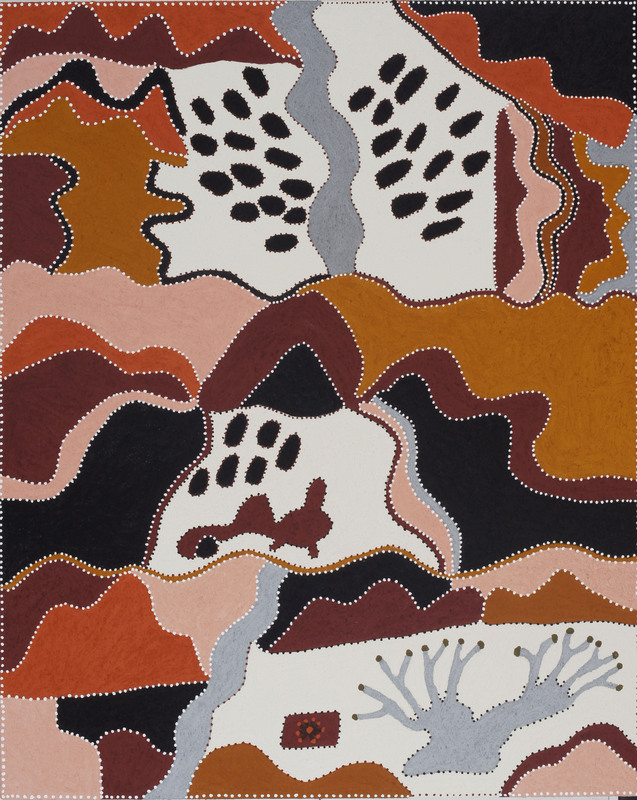 they want to start painting too.’ Shirley’s body of work explores sites and narratives associated with the country of her mother and father and is characterized by a bold use of richly textured ochre. Significant places such as Baloowa, Jirragin and Gilban lie on country now taken in by Violet Valley and Mabel Downs cattle stations. 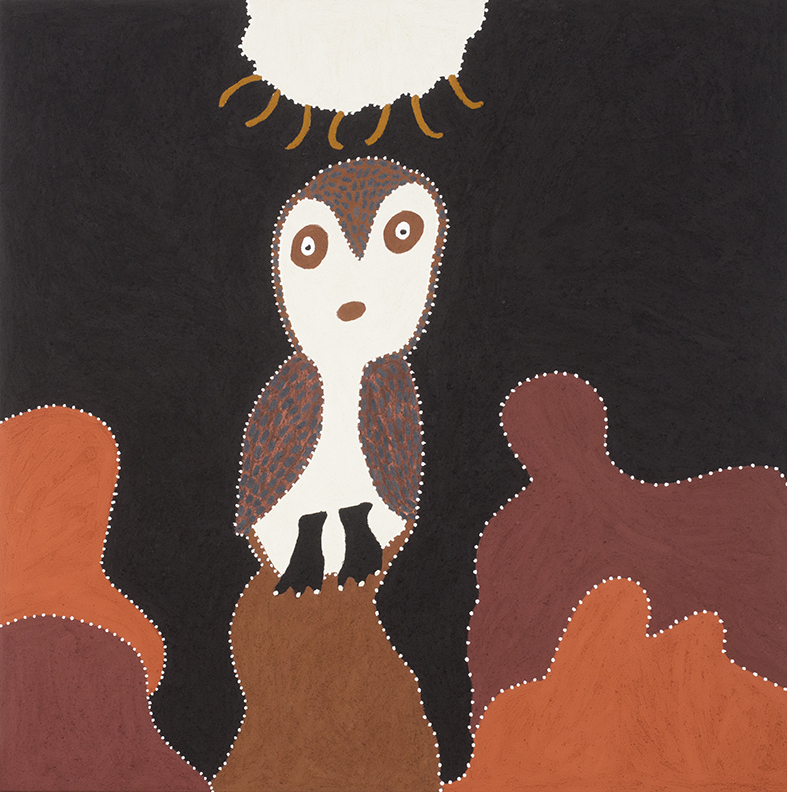 Much of her work also explores spirituality and the relationship between Gija conceptions of Ngarranggarni (Dreaming) and Catholicism. In 2007 Shirley was awarded the Blake Prize for Religious Art for her major work Stations of the Cross. Colonial histories of the region also figure in Shirley’s work in which she relates accounts of early contact, massacre, warfare and indentured labour since the incursion of pastoralists into Gija land in the late 1800s. Shirley’s works were displayed in a solo show at the Alcaston Galleries in Melbourne (2014). She also created a large body of 72 works on Gija medicinal plants and bush tucker Telling Tales: Excursions in Narrative Form, exhibited and acquired by the Museum of Contemporary Art (MCA), Sydney in 2016. In 2018, Shirley Purdie was selected to contribute to the National Portrait Gallery’s special 20th anniversary exhibition, So Fine! exhibition, commemorating ten important female visual arts practitioners. She continues to be one of Warmun’s leading artists and general leading elder at present.